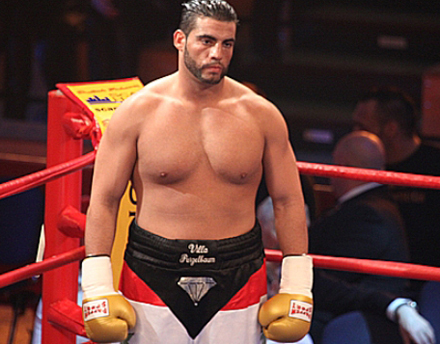 Heavyweight Manuel Charr (29-4) takes on Argentinian Gonzalo Omar Basile (68-11) on EC Boxing's show in Goeppingen (Germany) September 17 with the WBA International title at stake. Charr (pictured) is currently preparing in Hamburg with the EC team. The WBA Latin America strap is at stake in the heavyweight clash between Cuban Odlanier Solis (21-3) and Serbian (living in Sweden) Aleksandar Todorovic (8-9-1) and is now scheduled for ten rounds. The show is topped by Firat Arslan (37-8-2) and Nuri Seferi (36-7) with the WBO European cruiserweight title at stake. Also on the bill is a lighteavyweight fight between Karo Murat (29-3-1) and Yevgeni Makhteienko (8-4) and with the WBA International title at stake. First Lady Promotion's show in Norway headlined by the First Lady herself, Cecilia Braekhus taking on Ann Sophie Mathis will be a pro-am show. The show at the Spektrum was sold out before an opponent was announced for Braekhus and will be the first professional boxing event in Norway since the fall of 1980. That show featured the debut of heavyweight Steffen Tangstad, who six years laters (and 30 years ago almost on the day) challenged Michael Spinks for the world heavyweight title. Back to Braekhus no undercard fight with pro fighters have been announced. IBF Intercontinental featheweight champion Viorel Simion (20-1) defends the title against Spain's Andoni Gago (15-1-2) October 7 in Bucharest. Simion beat tough Belgian Alex Miskirtchian last time out and has been around since 2006 with long breaks between fights. Gago holds the Spanish and IBF International titles.